Yippee! I have completed another layout. This one is a paper based one using cardstock and embellishments from Club Scrap, the varsity kit. There weren't many photos taken during the week of 15-21 April 2012 so I didn't use a pocket page. Again it's a minimalist layout but at least it is memories scrapped. 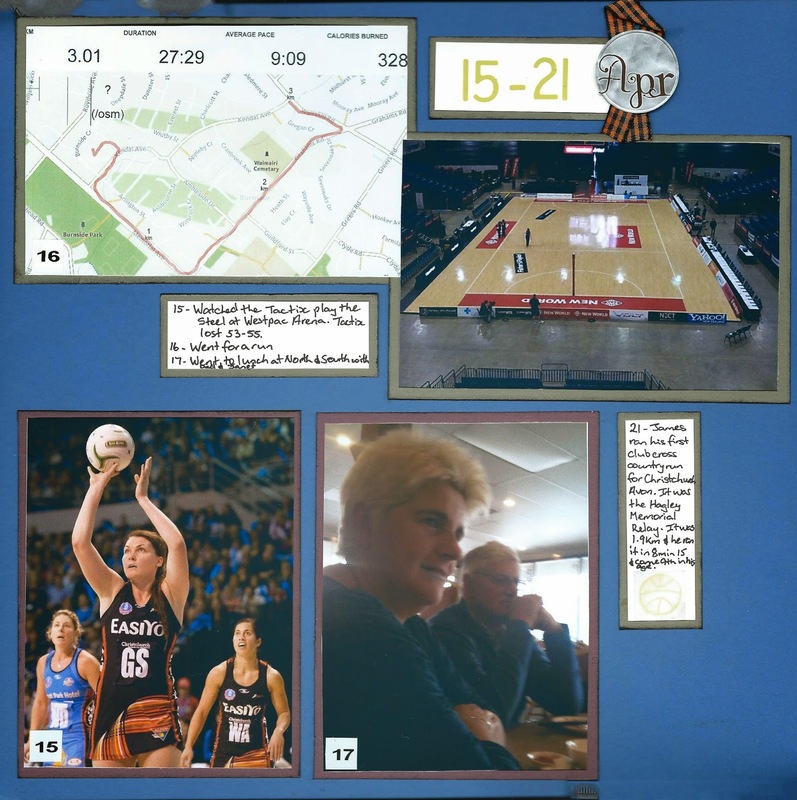 The photos of the netball and the Westpac Arena are not mine, they were sourced from the internet. 17 - went to lunch at North & South with Dad and Janet. 21 - James ran his first club cross country run for Christchurch Avon. It was the Hagley Memorial Relay. It was 1.9km and he ran it in 8 minutes 15 and came 9th in his age group. In other news I have just had a shipping notification from Artscow that my digital layouts have just been shipped out. I have asked for them to be printed as 12x12inch size and the exciting thing is I even got a discount of 20%. I was surprised because it said the discount would not apply to photo prints so I did wonder if it would apply to 12x12 layouts. It did, so I am very pleased. It will be nice to have some of the digital layouts I created years ago off my computer and safely stored in my scrapbook albums. Speaking of scrapbook albums I went looking through them the other day and I have a lot of them plus about 25 pages that need to be put in albums. I think I might need to rethink my strategy for the boys albums. At one stage I was keeping them with an album a year but with them getting older and not really being around all day everyday the photo opportunities are less. I think that from now on their albums will be of their childhood. Medbury started selling monogramed albums so I bought one for each of the boys so their Medbury photos can go in it. From now on I think any photos of the boys that really have no story line can go in a yearly album. The story photos (and there aren't many of those) I will create a photobook for. I have used Artscow in the past for their 6x6" photobooks and they were really good, so I think I will create an ongoing photobook of each of the boys for their special moments. That way it is not lots of huge albums for them which they may or may not ever want. That will feed my need to be creative and get their photos in books while making it not so arduous for them later.